If you haven't been to Kew before, don't miss the 19th-century Palm House, the tropical atmosphere of the Princess of Wales Conservatory, a walk to the iconic pagoda, and a climb up for a birds-eye view at the new Xstrata Treetop Walkway. Located in 300 acres of beautiful landscape Kew Gardens sits beside the river Thames between Richmond and Kew in south-west London. The Gardens are a World Heritage Site with six magnificent glasshouses, and are home to a remarkable collection of plants from all over the world including over 14,000 trees. Kew Gardens is a wonderful day out for all. If you haven't been to Kew before, don't miss the 19th-century Palm House, the tropical atmosphere of the Princess of Wales Conservatory, a walk to the iconic pagoda, and a climb up for a birds-eye view at the new Xstrata Treetop Walkway. Beautiful as the 17th century Dutch-gabled country house along the River Thames is, it could hardly be called palatial, particularly by royal standards, and yet it is one of London's most notable historic royal palaces. No small feat considering Kew Palace, which is set within the grounds of the Royal Botanic Gardens in Kew. Kew Palace earned its place in history by being exactly the opposite - retiring, modest and comfortable. In other words, it was the perfect royal retreat. Most famously, it served as just that for the prodigious family of King George III. First opened to the public by Queen Victoria in 1899, the palace was closed from 1996 to 2006 while undergoing £6.6 million of careful restoration and conservation. The money and effort have transformed Kew Palace from "a gaudy 1960s interpretation of the Georgian era" into a historically accurate study of the daily life and everyday domesticities of the palace and the royals who lived within it. 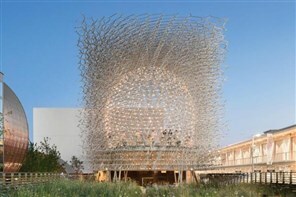 The Hive is a unique structure, inspired by scientific research into the health of bees. Designed by UK based artist Wolfgang Buttress, it was originally created as the centrepiece of the UK Pavilion at the 2015 Milan Expo. The installation is made from thousands of pieces of aluminium which create a lattice effect and is fitted with hundreds of LED lights that glow and fade as a unique soundtrack hums and buzzes around you. Tickets included in the price shown allow entry to all buildings and attractions within the Gardens, (including Kew Palace and the Royal Kitchens during summer months), the Shirley Sherwood Gallery of Botanical Art and the iconic glasshouses.